The finished and floating Arborescence on the Amsterdam canals; moving with the water, reflecting and animating, it is a piece suggestive of futuristic urban lighting. The team did such a great job installing this in the tough wintery conditions (whilst floating on a canal!) and it is a truly impressive statement and it is to remain installed for the duration of the Amsterdam Light Festival until January 18th 2015. All Images in this post are courtesy of Loop.pH. 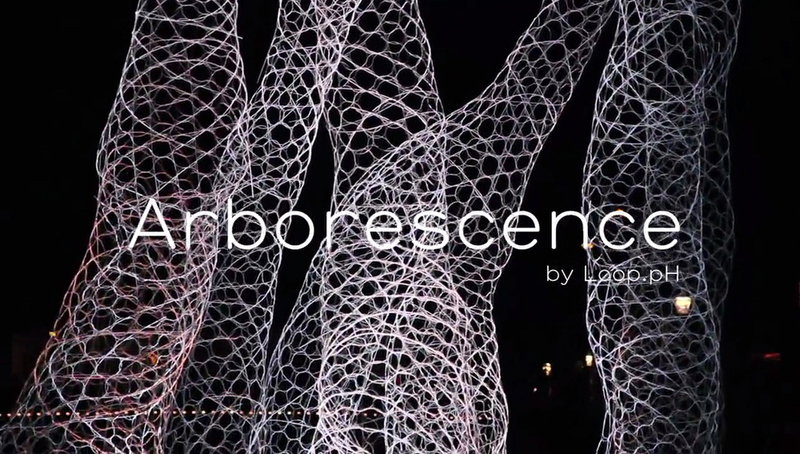 Whilst half of our team were working on the fabrication of Osmo in the studio, the other half went off to Amsterdam to install Arborescence for the Amsterdam Light Festival. Before they left, we were all manically working to weave all the Archilace sections, in the hope of making the install on water in Amsterdam a little easier! I loved the layers of archilace sections piled up on top of each other in the studio...nest like. 'Osmo; a beginners guide to constructing the universe' for Light Night Canning Town commissioned by The Brick Box. An immersive, star gazing experience, a surreal, other-worldly environment. 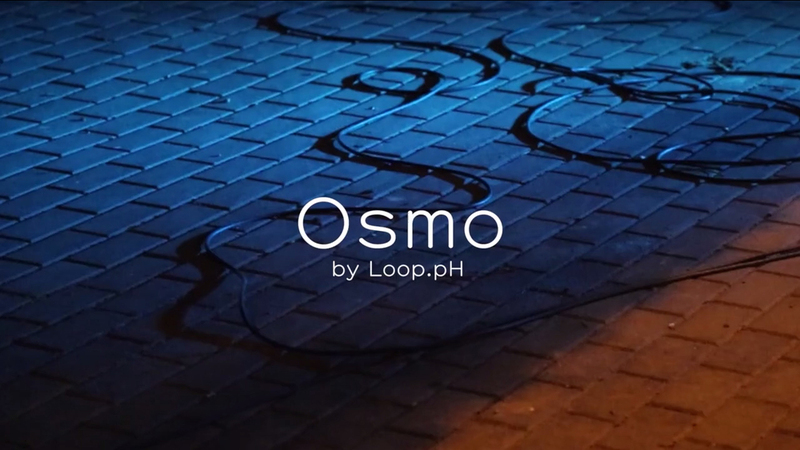 Video created by Loop.pH documenting the ephemeral installation Atmeture in Letchworth Garden City. Constructing Atmeture on location in Letchworth's Garden City. The piece went from a geometric structure to a breathing, inflating, smoking structure over the course of the day/night. Seeing how the atmosphere changed within the piece over this period of time was very intriguing - a completely different feel in the dark to in the light. "A beginners guide to constructing the universe." Working with fibreglass using a technique developed by Loop.pH called Archilace, we have been developing ideas for a commission for Letchworth Garden City's Fire & Fright Festival for onedotzero. Including inflatables to explore ideas surrounding breath, the installation will be a moving, breathing installation. We've been exploring the integration of inflatables, smoke and light with the structures in the studio, whilst testing material strengths and light qualities...more to come! We've finalised the lace panel designs in the studio recently and have been lacing the final panels. It's exciting to see the patterns come together and I can't wait to see how they all come together in the final piece! Lots and lots of lacing ahead! I'm almost at the end of my placement which was initially just for the Kensington Palace project, but excitingly have been asked to stay to work on a freelance basis on some new projects that are in the pipeline over the next few months for Loop.pH. There are also some new interns joining the team and I am to be involved in helping train them in the lace making techniques, so they can work alongside me in the finalisation of the Archilace piece. I'm really looking forward to passing on a skill set and to work alongside a new team of people! Recently we've moved onto working at the scale that the Archilace panels will be laced at, to work closer towards the finalised design. There are still some small things to tweek before we start on the final piece with the electroluminescent (EL) wire...but the patterns are really starting to become visible at large scale now. Eight panels slightly larger than the one photographed above will be stitched together to create the final piece! I've also been getting my electric mindset back on again to prepare the EL wire for lacing, making sure that they can be wired up easily for animation once the lacing is finished. We will be using 256 bobbins and 4000 metres of EL wire to create the piece! An awful lot of bobbin making!! Continuing to explore lace making designs - exploring patterns in the triangular forms that the installation shall be made up of and experimenting with lace border designs. Sampling, sampling, testing, testing. We're inching closer to having a finalised design for the piece. The first version of LED Sonumbra is a development from Loop.pH's original Sonumbra installations that used EL wire, the introduction of LED strip enabled the piece to be animated in it's changing colour patterns. After finishing fabricating this, this week, it travelled to Elton John's Garden Party and then onto a conference in Milan. As well as developing ideas and sampling for the Kensington Archilace project I have also been involved in fabricating the piece LED Sonumbra to be installed both at Elton John's Garden Party and a medical conference in Milan this weekend. Each individual LED strip was covered in gold foil and glass beads before we structurally constructed the installation's form. I also learnt a fair bit about electronic wiring this week - as I wired up all the strips to the circuit in order for them to be animated. I'm really enjoying being involved in all the aspects of creating these installations - learning new skills that aren't linked to a background in textiles but are practicalities of creating installation work. I shall be back to post updates of the final installation at Elton John's Garden Party soon! Next week I shall be back working on the development of the Kensington Archilace. In my first week at Loop.pH I've been learning about, and using different bobbin lace making techniques (usually used on a tiny scale) and have been expanding the stitch techniques to be used on an architectural scale! These will later develop into new patterns and lace designs to re-create a more developed design of the original Kensington Archilace. I have recently been offered the opportunity to intern for 6 weeks with the Loop.pH design team on the re-making of their Kensington Archilace installation at Kensington Palace. Loop.pH is a Spatial Laboratory experimenting across the fields of design, architecture and the sciences and was formed as a new creative practice that reaches beyond specialist boundaries. With my own practice developing out of a background in textiles into architectural installation, spanning both art and design worlds, the experience of working alongside a team that isn't tied to a specialism will be of great benefit to me in helping the development of my own practice. Furthermore Loop.pH's focus on creating experiences and environments to imagine and dream within, is an area that I have myself been exploring, most recently in the creation of the installation Iridescent Immersions. I'm excited to get started and look forward to sharing details of my progress soon!